Preschool graduation marks the first academic milestone before a child enters elementary school. Planning a graduation to celebrate this achievement is sometimes a difficult task because it is important to make it fun for children in order to encourage a love of learning. Coming up with a preschool graduation theme can help make event planning easier and encourage a lighthearted atmosphere. Graduation themes for preschool can be fun and educational. Sometimes a theme can tie in an area of the curriculum that kids have been studying all year, like the ABCs. Other themes can use a favorite subject of the class to get them excited about graduation and the ideas learned throughout the school year. Book themes: Which books did the class read this year? Choose a favorite one and make it the theme of the graduation. Decorations, the graduation program and activities should all be planned in accordance with the theme. Teachers and parents can dress up as characters. My favorite thing: This idea helps showcase the kids' personality and how much they have grown during the school year. Each child picks a favorite thing and makes a short booklet about it, which are on display at the graduation. The decorations and activities incorporate aspects of all the kids' favorite things in some manner. Growing garden: Make a festive and colorful garden graduation ceremony. Many of the flowers are the kids' artwork and craft projects from the school year. The theme revolves around growth and how the kids have learned so much, like a blooming plant. When I grow up: Kids share what they would like to be when they grow up. They make an art project relating to this job, which will be displayed at the graduation. The decorations and activities embrace all of the different careers kids are interested in. 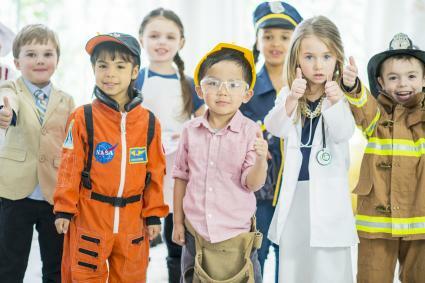 There could be a dress-up area where kids can put on costumes relating to their dream career. Animals: Many kids love animals and fortunately there are nearly endless ways to create a fun graduation ceremony or party in this theme. School projects relating to animals can be on display. The ceremony could be decorated like a jungle and each child could be assigned an animal character and has to present a few words about the animal. ABCs: The alphabet presents many fun opportunities for an educational, but fun, graduation ceremony or party. Kids could be assigned a letter and must remember the letter and its position in the alphabet for games and activities. A display table showcasing the kids' achievements could be arranged in an alphabetical way, with festive decorations. Cartoon characters: Cartoon characters present another opportunity to engage kids for learning and help them enjoy their graduation activities. Decorate in the character theme and have many related games, songs, and activities. A teacher or parent could also dress up as the character to interact with the kids. Buckets of (learning) fun: Use this clever play on words to help avoid the summer slide as kids jump from kindergarten to first grade. Decorate with a beach theme. Use projects that you've recently done studying ocean animals or the beach. In addition to a diploma or certificate of achievement, present each child with a bucket full of learning activities such as flashcards or a small phonics card game. Road trip: Use the idea of taking a journey or a road trip to really put some pizazz in your theme. Decorate with roadmaps and things that make you think of a road trip. For each 'stop' feature student work from a different unit. You can prepare a video of the kids talking about what they learned this year on their journey to play for parents. My future: Encourage kids to think of their graduation as one step closer to the future. You can decorate in school colors because the focus is all about the students and what they dream of becoming. Encourage students to wear something that speaks to the career they hope to be. For example, an astronaut can wear a rocket ship pin, a doctor could wear a stethoscope. Walk of fame: Let kids know they are superstars by rolling out a literal red carpet. Before the ceremony, help kids write on a star their biggest accomplishment this year. Hang the stars up along with a picture of each student. Showcase each student's best work so they know they have a lot to be proud of. Use the theme in every aspect of the event: Try to transform the ordinary room into a space that would fit perfectly in the theme. Graduations for preschoolers are less formal than any future academic graduation. For this age group, parents and teachers can plan a fun event that kids can really enjoy. Incorporate the theme in all decorations, diplomas and paper products, and let the parents know what the theme is in case they want to coordinate their preschool graduation gift with the theme. Don't spend a fortune on supplies: Now that you have a theme, it doesn't mean that you have to spend a fortune on related products. Make your own decorations and game supplies whenever possible. Talk to other parents and teachers for ideas: Look for ideas from past preschool graduations and get event-planning recommendations from others. Use the theme as a teaching opportunity: Plan games, songs and activities that fit into the theme, but also use some of the learning skills the kids worked on during the school year. This will show the parents how much the kids learned, help the kids feel more relaxed about the event and help them associate learning with fun. Let the students dress thematically. Have kids wear attire that is appropriate for graduation but somehow harkens to the theme. Whether it's pins, decorating their graduation caps or even themed socks. Use music to enhance your theme. While a graduation is hardly complete without the traditional Pomp and Circumstance, that doesn't mean you cannot incorporate themed music into the beginning, or have the kids learn a song to share with parents at the end. Do a unit study on your theme towards the end of the year. This way, you have a ready-made cache of student work to showcase on the big day. Have the kids recite poetry that relates to the theme somehow. You can make a video of this to avoid jitters that come from stage fright or unforeseeable moments when 3 and 4-year-olds get the microphone. With a little research and planning, you can plan an event that the kids will love and remember forever. 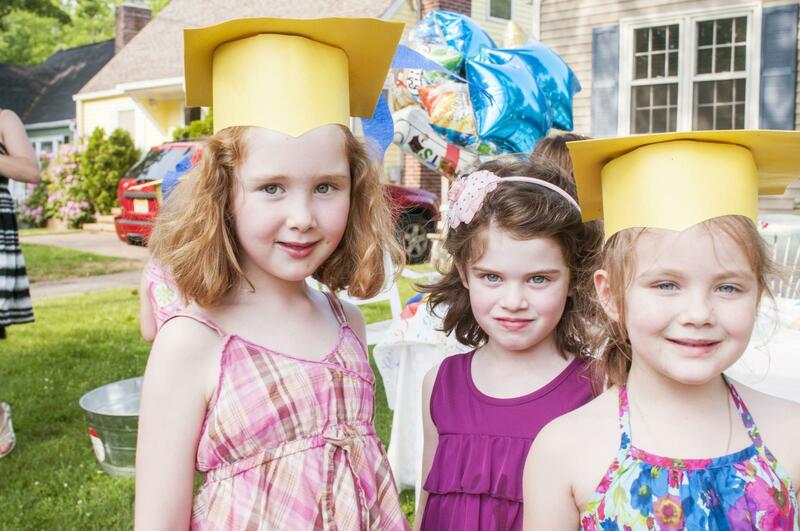 A memorable and fun preschool graduation party or celebration is a good way to kick off the rest of a child's academic career.